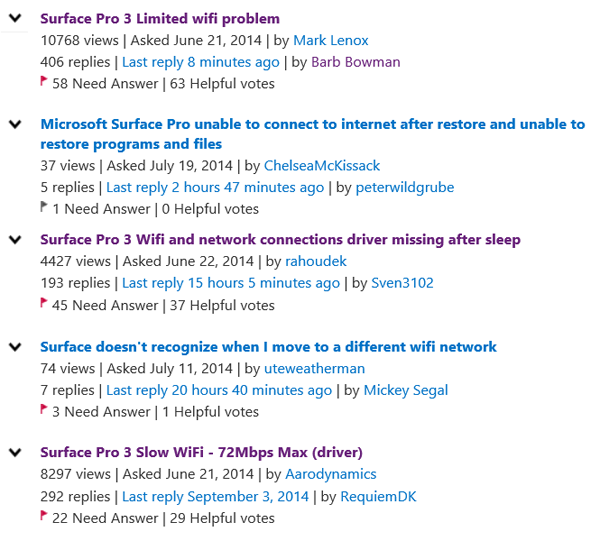 I’ve been involved in a couple of threads on Microsoft communities like http://answers.microsoft.com/en-us/surface/forum/surfpro3-surfnetwork/using-surface-pro-3-in-europe-no-support-for/91d6f4ec-f9d1-4bfe-a0f5-f2bbd6517053 which highlight and issue that Microsoft doesn’t seem to care about. If you read the above referenced thread, you can draw your own conclusions, but as *I* read the available information, Microsoft owes folks a localized optional driver. 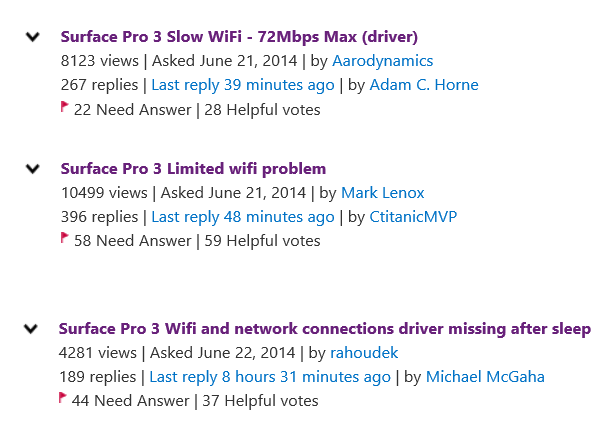 We have received a limited number of inquiries related to Wi-Fi connectivity on Surface Pro 3, which we are actively investigating. We are committed to providing the best customer experience possible and are working to quickly resolve. Gee whiz. How about moving beyond the marketing-speak and provide a real “status”. You can be sure that the number of people lurking and not posting is far larger than the number of replies. Surface Phone and Chat Support has had people refreshing and resetting (which won’t resolve these issues) and they’ve replaced hardware. Some folks have replaced their hardware 4 times. The official Forum support folks posted a vague statement a while back that “fixes would be available in the September timeframe’. It’s hard to tell if they even have a handle on the various issues since their participation has been abysmal. Refresh/reset is not participation. 4. Machine goes to sleep at home, travel elsewhere and on wake, SP3 doesn’t realize environemnt has changed and reports old SSIDs and does not see current SSIDs. 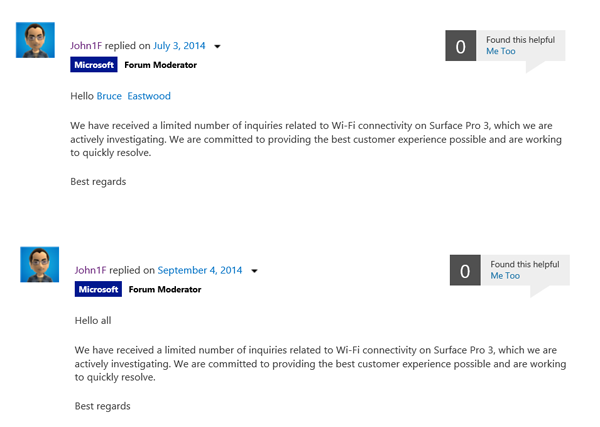 There are reports of some routers that the Marvell WiFi in the SP3 won’t connect to at all. If the same SSID name is used for 2.4 and 5GHz, the Marvell WiFi never sees the 5GHz. Microsoft, you need to ENGAGE with your users and give them a status. The forum has turned ugly. I’m done trying to support your users on this issue. I know they don’t mean to take out their aggravation on me, but I’m not willing to get beat up. I have some theories, but am having trouble extracting answers to my questions in these threads because I’m asking afflicted users to make changes to their router configurations WHICH THEY SHOULD NOT HAVE TO DO UNDER NORMAL CIRCUMSTANCES. I’ve developed a couple of theories about some of the connectivity issues. 1. SLOW WIFI: Some routers (Apple has been doing this for years) ship with both the 2.4 and 5 GHz channels set to the same SSID (name). Other vendors have started doing this, some by default, others let you specify this optionally. It’s marketed as an “Smart Connect” type config where the “best” channel is selected by the client/router automatically. I asked a couple of users in the forum about their config and learned that they were using the same SSID. I asked them to make a change and specify unique SSIDs and attach to 5GHz. They’ve reported their problem has disappeared. Over the weekend, I experimented with my newest Netgear Router, the newly released R8000. This router has TWO 5GHz radios that support the newest 802.11AC speeds. Netgear optionally offers the “Smart” connect where you can enable the same SSID name. You have no control which radio you connect to when this is enabled. If you enable this kind if smart connect on routers covering both the 2.4 and 5GHz bands on certain routers, apparently you will always connect to the 2.4GHz SSID if you are using a Surface Pro 3. For folks with 2.4GHz 802.11n routers with no 5GHz, your speeds will be slower than if you had a dual band router. There’s just no getting around this. 2. LIMITED CONNECTIVITY WHEN COMING OUT OF INSTANT GO ‘SLEEP’: Most routers ship with channels set to auto select so that the user doesn’t have to figure out what channel has the least interference/usage. I’ve always changed this to specific channels here and have had no issues. My theory here is that while the SP3 is in InstantGo sleep mode, the channel has changed and the Marvell adapter can’t find it. 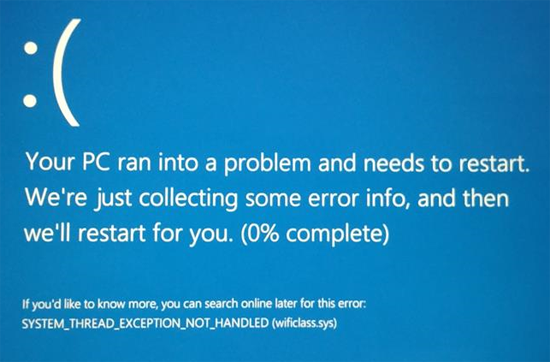 Similarly, if the initial connection is made, while using the SP3, if the channel changes, the same “can’t find new channel” situation occurs. I’ve been asking people to make changes in their settings to test this. Again, I know this should not be necessary. But it would seem to be a great diagnostic.